AC Milan suffered a second successive defeat as Sampdoria ignited the Champions League race in Serie A once more with a 1-0 home win gifted to them by Gianluigi Donnarumma's error. The Rossoneri's 10-match unbeaten run in all competitions was ended before the international break as bitter rivals Inter won at San Siro - and Gennaro Gattuso's men were beaten again on Saturday. A dreadful Donnarumma error handed Gregoire Defrel a first-minute opener and the visitors never recovered on a difficult evening in Genoa. Milan remain fourth but, ahead of Sunday's fixtures, fifth-placed Roma are four points back and have played a game less, while Lazio - a further two points behind their city rivals - have two matches in hand. Eighth-placed Samp are six points behind Saturday's opponents. The goalkeeper was more impressive as he turned Fabio Quagliarella's low drive around the post, however, before Emil Audero expertly parried Suso's curling effort away at the other end. Defrel volleyed over the top from a glorious Nicola Murru cross early in the second half, while Suso continued to pose a threat for Milan and his deflected effort wrongfooted Audero and bounced just wide. 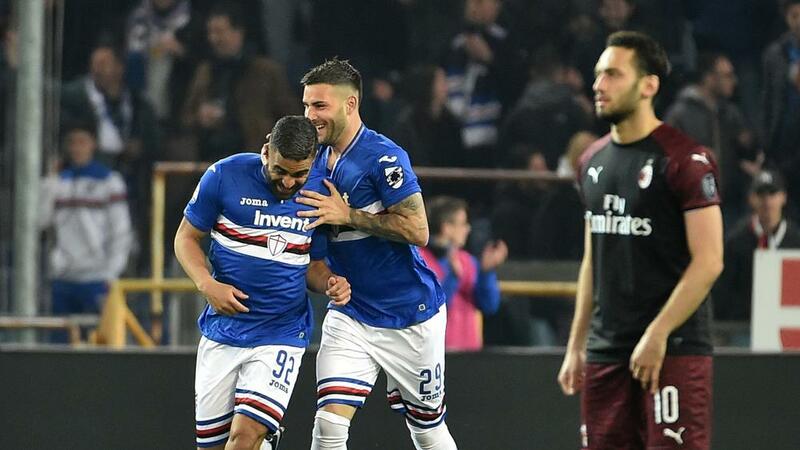 Quagliarella, chasing his 22nd league goal of the season, saw a powerful strike deflected against the crossbar and Defrel shot straight at Donnarumma, but Samp were made to settle for a narrow victory. Milan kept chasing until the dying seconds but Krzysztof Piatek was first denied a penalty after a lengthy VAR delay and then directed a header straight at Audero. Milan were just threatening to pull away from the pack in fourth place heading into the derby against Inter. Now, having shown their fallibility, and with a trip to Juventus to come, Gattuso's men have opened the door for others to pile on the pressure. Roma and Lazio are in the mix, but Sampdoria, with Quagliarella in form, should not be discounted. The focus was on the strikers ahead of this match, with Quagliarella and Piatek two of the form men in European football. But Defrel's hard running and instinctive finish just seconds into the contest saw him thrust into the spotlight. His performance could have been capped with a second goal as he twice went close. Donnarumma's incredible error gave Sampdoria the lead inside the opening minute, but this was far from an isolated incident. Both the goalkeeper and the defenders in front of him repeatedly gave up openings due to sloppy play out from the back, with the personnel apparently ill-suited to Milan's elected approach. Milan welcome Udinese to San Siro on Tuesday, before Gattuso takes his side to Juventus next weekend for that crunch Serie A clash. Sampdoria go to Torino in midweek and then host Roma.